In this Year of Mercy, many Christians may be re-energising their pastoral skills to respond to the call to visit the sick. But do the sick want to be visited by religious folk if they don’t any longer connect with a particular religious tradition; and what outcome ought the visit to be aiming for? If you’re a chaplain working in a hospital that hosts several hundred guests 365 days a year with an average bed stay of 3.4 days, how do you decide who to visit? And if your contract says you are also there to support staff, which of the 2.5 thousand should you support today and how might that be achieved? The Interchurch Council for Hospital Chaplaincy (ICHC) and Manawatu’s MidCentral DHB (MDHB) have formed a ground-breaking partnership to embed spiritual care into core health service so that spiritual needs are attended to by the best person for the job at the time. This may mean front-line staff offer generalist spiritual care whilst chaplains are specialists dealing with more complex issues and training first-line responders. The goal is that by 2019 the Transforming Spiritual Care project will be helping to recognise and meet the spiritual needs of the MDHB community in all its diversity. Transforming Spirituality is grounded in international research and networked into spiritual care organisations in Scotland, Australia and the United States. Their first action research project addressing spiritual care in a cancer treatment ward is about to be written up for publication. Another important step is to understand the particular spiritual needs of the diverse MDHB population. A series of focus group meetings are planned so that needs are understood and spiritual care is developed within a partnership model. It matters that we understand the spiritual needs of our population and meet those in the most compassionate way possible whilst working collaboratively towards positive health outcomes within a complex yet vibrant healthcare community. Sande Ramage is employed by ICHC to work as Spiritual Care Co-ordinator at MidCentral DHB based at Palmerston North Hospital. She can be contacted on phone (06) 350-8690 or mobile 027 4788-184. Sr Margaret at her QSM investiture. Sr Margaret Lancaster of the Little Company of Mary received her Queen’s Service Medal from Governor General Sir Jerry Mateparae at a ceremony at Government House, Wellington, on Thursday 14 April. She was recognised in the 2016 New Year’s Honours list for her long-standing contribution to palliative care in Wellington. 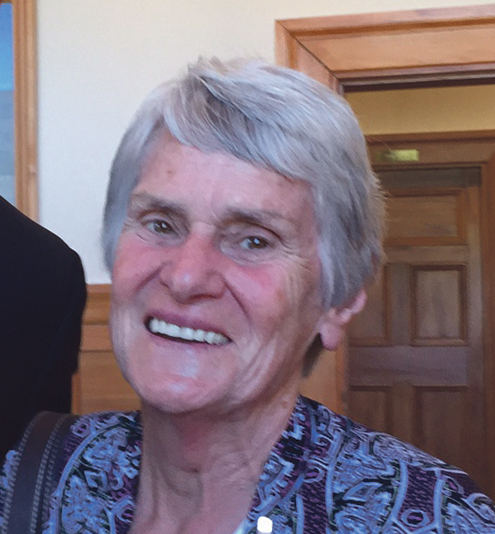 ‘I feel humbled and at the same time pleased I can accept this honour on behalf of all those who helped establish the Mary Potter Hospice in Wellington, the first Hospice in Aotearoa New Zealand,’ Sr Margaret said. ‘It took me a while to accept the medal because what I do is not about me. The whole spirit and ministry of our foundress Mary Potter was to care for the sick and dying. But over the weeks the significance began to grow on me for what the medal represents in recognising the importance of this work. Sr Margaret was the driving force behind the creation of the Mary Potter Hospice and has been at the forefront of the development of the palliative movement across the country. Dr Alan Gray, a consultant oncologist at the time, says Margaret established responses to the physical, social and emotional needs of patients. Margaret brought bereavement counsellors on board and established a system of volunteers. The first counsellor, Max Cavit, says Margaret is an inspiration. He witnessed the long hours she worked in the Hospice, with the medical community, with politicians and with charities. Sr Margaret says the hospice movement is broadening its work from palliative care to include chronic-disease management at a person’s home. ‘Our society has lost sight of the value of community support and care for the sick and dying at home. In this year of Mercy I want to promote compassion back into communities. Following her retirement Sr Margaret continued to explore techniques for the greater comfort of the dying, and to teach specialist carers. She works with people in the Wellington community who may otherwise not be able to live independently by helping with budgeting, gardening, provision of meals, housekeeping, and social support.